Ian, a Doberman Pinscher-retriever mix, gets ready to jump and push his nose against a Staples "That Was Easy" button held by owner Carol Sippel, of Renton. If Staples is looking for a new spokesperson, make that spokesdog, I have the perfect candidate. Meet Ian, a 3-year-old Doberman Pinscher-retriever mix, owned by Carol and Walt Sippel, of Renton, whose in-home training for one of America’s popular new dog sports, treibball, includes repeatedly placing his nose against Staples’ “That Was Easy” button and getting a desired response. The couple began talking about finding something they could use to force Ian to push harder and encourage a reaction. “That’s when I remembered my co-worker’s Easy button. So we put the tape on it and he touched it, but not hard enough to activate it. We pushed on it a few times. He must have thought it was fun game or liked the voice, because he began activating it the same night we brought it home. Now we can use it as a game or as reward for accomplishing another objective,” says Walt Sippel. 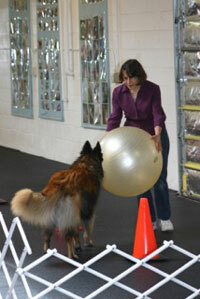 Kathy Weaver, Family Dog Training Center instructor, puts a ball in front of her Belgian Tervuren, Troy, to nose during a training class at the Kent facility. 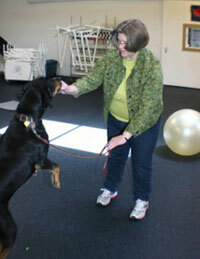 Troy is used as a demo dog during many of her classes. Treibball involves the dog leaving its handler and going past eight balls set a specific distance away (called the “outrun” or “go-out”), waiting for a cue to push and then using low, hard pushes to maneuver one ball at a time into a netted goal within a time limit. Treibball originated in Germany (translated from German the meaning is “blowing ball,” “drifting ball” or “propelling ball”) several years ago as a game to attract herding dogs. Eventually it made its way to the U.S., where a national sanctioning organization, American Treibball Association, has been founded. It’s not all about moving forward in Weaver’s classes. Sometimes one-on-one guidance is required when a particular skill deteriorates and a “fix” is needed. This occurs if something was skipped or not well developed in foundation training, she explains. 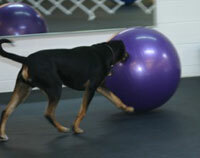 Before enrolling in a treibball class, participants must respond to basic obedience commands, which provide a solid starting foundation for learning the unique skills required in the sport. Alyssa Shewey, of Covington, right, encourages her 4-year-old border collie Callie to nose her way toward treats placed in a mat while Weaver watches. Like many others, Weaver was attracted to treibball via a YouTube video, recommended by a friend. “She thought I would find the sport interesting because from 1983 to 2003 I trained border collies to herd sheep and cattle while managing a 500-ewe flock and groups of 20 feeder cattle in Southern Missouri. I also competed in the United States Border Collie Handler trials throughout the country in which we worked primarily sheep but on occasion, cattle. After my last border collie passed away in 2003, I moved to Seattle and eventually acquired my current Belgian Tervuren, Troy,” says Weaver. Time and distance ruled out herding, hence the urban alternative became treibball. Advantages include: it can be trained in the backyard, park or training facility; it doesn’t require extensive equipment; it involves teaching the dog a variety of skills that are useful in everyday life and other dog sports; it provides an opportunity for dogs to work off excess energy. Ian pushes a treibball the length of a test course at Family Dog Training Center in Kent. It’s not in any training book, but the Sippels have come up with another little twist of their own at home to keep Ian’s treibball skills sharp. That includes opening several kitchen doors, then watching him come along later and nose them shut. “It’s become kinda a game with him,” adds Carol Sippel. The doors twist and eventually the ball came after the Easy button. “We started with the doors being open just slightly so that he wouldn’t be too startled. We were able to progress fairly rapidly from hand touch to Ian pushing the doors on his own within two weeks,” says Walt Sippel. Ian has graduated from a soft Nerf-type ball about the size of a basketball to a beach ball and finally a large treibball. On the final day of the six-week class in mid-June, he pushed the game ball from start to the goal with a single command. “Not bad for a dog that was labeled as ‘unadoptable’ just over a year ago,” Walt Sippel smiled. While Ian showcased his prowess in class, Callie, a 4-year-old border collie mix owned by Alyssa Shewey, of Covington, focused on food rewards wrapped in a small mat on the floor. This exercise is designed to teach the dog to nose its way to the treats and in the process eventually open the mat entirely. 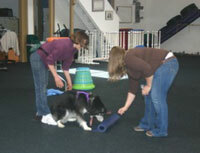 In the intermediate level, students expand the basic skills, increasing the “go-out” distance, decreasing or eliminating the target mat, helping the dog to solve problems such as extricating the ball out of corners, working with multiple balls, maintaining correct ball-pushing direction (toward the handler). Another area treibball pioneer, Diane Garrod, of Langley (Whidbey Island), sees seven to 15 students in her beginner and intermediate classes. To provide an incentive for them to stay involved as they progress, she and Weaver are hoping to organize an American Treibball Association Northwest Division with informal competitions. Because the sport is still somewhat in its infancy in the U.S., the American Treibball Association, headquartered in Colorado, has not developed a sanctioned competition schedule as yet. Recently, ATA leaders asked membership to suggest changes to the original set of rules it developed. The board is studying those recommendations to create a new package of competition regulations that it will send to the membership for a vote this summer.